Well done to Lauren who entered the United Styles Association competition held in Birmingham this weekend. Our thanks to the organizers for a well run event. Lauren did really well and her Kata was very much a step forward, although she had a minor wobble at the start it was a really good effort. 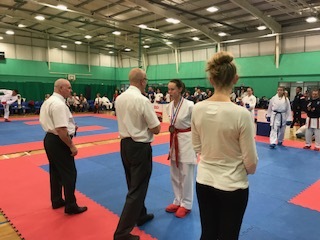 She also entered the Kumite and had a hard fight to gain the bronze medal. The club are proud of you for flying the flag of Chineham Karate Club. Next Next post: Well Done Josh !! !